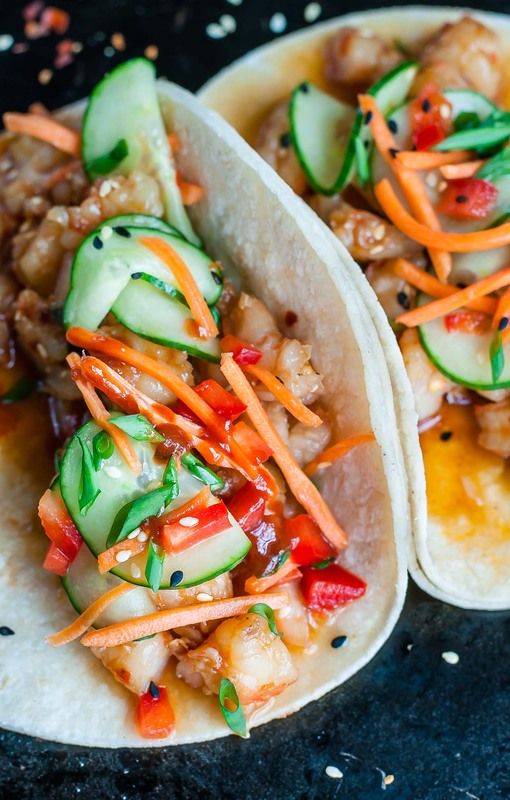 Spicy Szechuan Shrimp Tacos with Cool Cucumber Slaw are ready to shake up your taco game! A fun fusion of two of my all-time favorites, these tasty tacos are ready to rock your plate in under 20 minutes. I did something completely ridiculous. For some reason I thought it would be a grand idea to combine my most popular stir fry recipe with my favorite tacos. The result was an Asian-Tex-Mex abomination that I cannot stop thinking about! I could wax poetic on the whole delicious ordeal until we all lose our minds, or simply dive right in to the recipe. Put on your goggles yo, we’re diving in! You’ll swear you plucked them straight off a trendy street side taco truck, but these tasty fusion tacos are ultra easy to whip up at home! Shrimp are cooked in a sticky, flavorful sriracha-spiked Szechuan sauce and topped with a cool cucumber slaw. Customize the experience by controlling the Sriracha and red pepper flakes to make these tacos mild, zesty, or straight up incendiary! 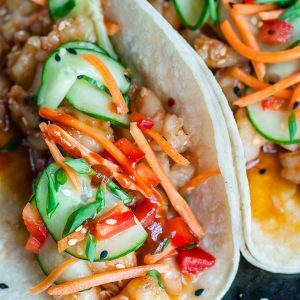 Szechuan Shrimp Tacos with Cool Cucumber Slaw are ready to shake up your taco game! A fun fusion of two of my all-time favorites, these tasty tacos are ready to rock your plate in under 20 minutes. Clean and peel shrimp, defrosting if using frozen. Lately we've been buying frozen, cleaned, easy-peel shrimp. All I have to do is defrost, peel, and cook! You can also buy your shrimp already peeled if you'd like! In a small bowl, whisk together sweet chili sauce, soy sauce, minced garlic, Sriracha, red pepper flakes, and ginger. Set aside. For the slaw, slice cucumbers paper-thin using a sharpened knife or mandolin. (I use the slicer on my oxo grater set). Combine with shredded carrots and bell pepper and toss with seasoned rice vinegar and honey, to taste. Heat a large pan or skillet to medium-high heat with 1 TBSP of oil and sauté your shrimp. Cook on one side for about 2 minutes, reduce heat to low, stir in your sauce, and continue to simmer until shrimp curl and become opaque. The cook time will depend on the heat setting you choose and the size of your shrimp, but regardless they’ll be perfectly cooked in a matter of minutes. 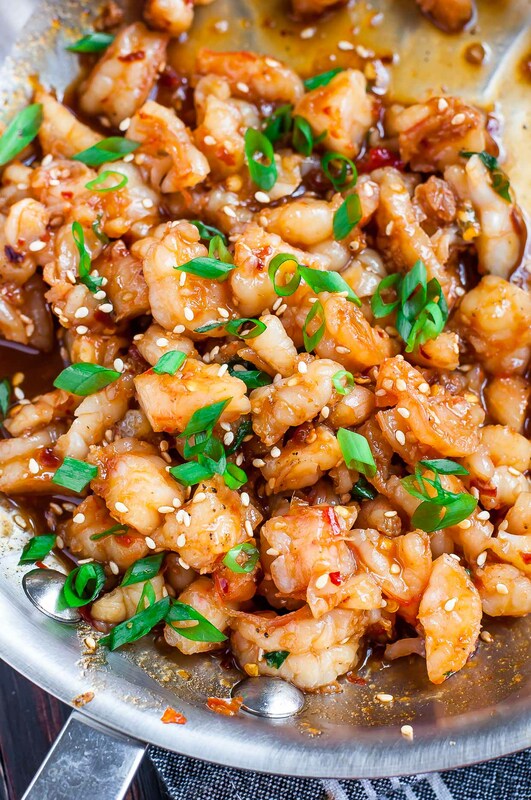 OPTIONAL: Want a thicker, stickier sauce on your shrimp? Do what the restaurants do and whisk 1 tsp of cornstarch into 1 TBSP cold water. This can be whisked into your sauce to thicken it. Place your shrimp on a clean cutting board and chop into smaller pieces, much like you were coarsely chopping an onion. This extra step helps prevent the shrimp from dive-bombing out of your taco and onto your plate/lap/floor and makes them way easier to eat! Want them whole instead? Go for it, yo! Dig in while they're hot! TORTILLA TIP: The amount of tortillas you use will depend on two factors: how many you're serving and how full you're stuffing each taco. For 4 tacos you may be able to get away with just 4 single tortillas or you can double up with 8 to prevent tearing. Totally up to you! 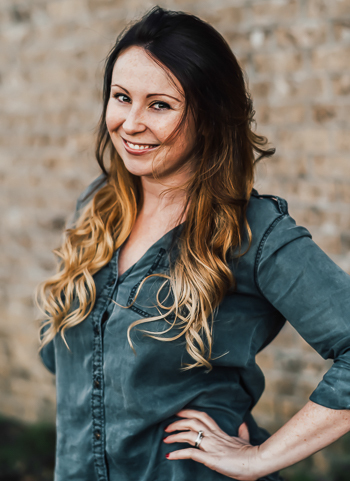 See post below for special diets + swaps. * No sesame oil? No problem! You can use olive, coconut, or avocado oil if needed. I used corn tortillas for my tacos but feel free to use flour tortillas if you prefer! Both work excellent. Need a vegan or vegetarian swap? Stir fry tofu or a medley of veggies in the sauce and use your favorite sweetener in place of the honey. I’m a big fan of making veggie cauliflower tacos so feel free to check out that recipe as well! No tortillas? No problem! Get your low-carb or paleo on by making these sassy shrimp tacos in lettuce cups instead of tortillas. Fan-freaking-tastic, yo! I’m hopelessly in love with these fusion-style Spicy Szechuan Shrimp Tacos. As written the recipe is slightly spicy (as Szechuan shrimp should be!) but not in face-melting territory by any means. Adjust the crushed red pepper flakes and Sriracha chili sauce to taste. You can make these zesty tacos mild, medium, or hot based on preference. We added extra Sriracha and pepper flakes after the photos were snapped because we clearly like to be assaulted by our food. Haha! However you spice them, be sure to get these scrumptious shrimp tacos in your face, stat! Then try my classic shrimp taco recipe next! I feel your recipe instructions are missing a step, to heat the sauce and return the cooked cut shrimp to the sauce. Delicious! So healthy and colourful! These look so amazing! The colors in that cucumber slaw are also insanely bright and beautiful. Lol, I would probably end up overstuffing my tacos big time. Overstuffed is totally the way to go, haha! That slaw sounds like the perfect complement to the spicy shrimp. What a fabulous meal! Thank you Allison! We love it so! Who can wait for Tuesday to devour these! They look so good! Oh my goodness, I’m going to be making these!! I love all those flavors!! Yay!! Hope you adore it, Mindy! This looks so delicious, and refreshing with the cucumber! Perfect for summer.